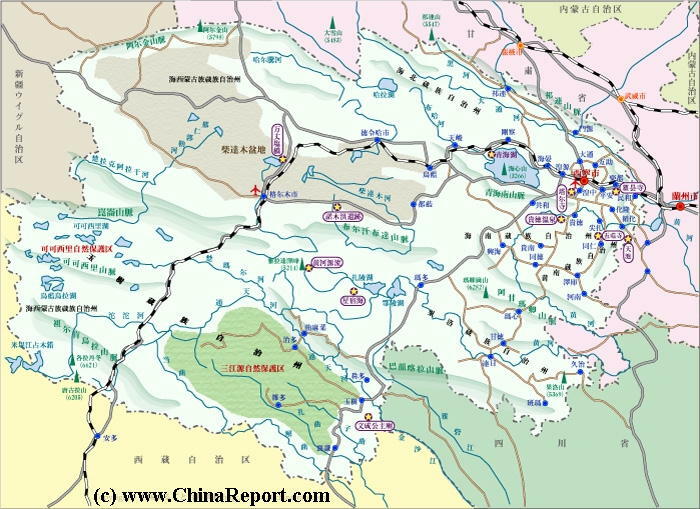 There are a growing number of maps available on Qinghai Province, Qinghai Lake, Xining City and regional topics. Get an overview of Qinghai Province, topography and geography, landmarks, monuments and scenic sites. Then click through to each location and destination to find more information and photos. please refer to our: 'Full Introduction to Qinghai Province - Index' . Main Pillars of the economy today are mining and petro-chemical industries. Qinghai is especially rich in minerals who's deposits are increasingly exploited. Minerals found in abundance include Kainite, asbestos, glauber's salt, silica and boron. Especially boron is found in no higher quantity than in Qinghai Province. Qinghai Province is also surprisingly rich in Oil, Petrol and natural gas reserves.The Qaidam Basin in the North-West is the center of Oil and Gas Industry as well as the scene of frantic mining activity. A third main pillar of the Qinghai economy is that of animal raising. The grasslands of Qinghai are especially fit for raising horses, as well as sheep and Yak. Read More in: ' Economy of Qinghai Province'. Qinghai Province is a largely Tibetan Province with a unique history as it was only absorbed into The Peoples Republic of China in 1959 AD. Until 1950 AD, when a Chinese Military campaign into East Tibet took place, Qinghai Province did not exist other than as an inseperable part of the Tibetan Region and The Nation of Tibet. Today Ethic minorities make up more than 2.38 million, or 45.5 percent of the total population of Qinghai Province. Of them the far majority are Tibetan, Hui, Tu, Salar and Mongolian. The Tibetan people account for 21.89 percent of the province’s population, the islamic Hui 15.89 percent, Tu 3.85 percent, Salar 1.85 percent, and Mongolian 1.71 percent. The remainder are Han imigrants of whom more and more are entering Qinghai Province. The Main Rivers in Qinghai are the Yangtze River and the Yellow River (Huanghe He), which both spring from regions in the South of the Province. Others are the Shule River, Datong River, the Buh River, the Qagan Us River, Urt Moron River, Narin River, Togton River, Tongtian River, the Dam Qu (River), Zha Qu, Ji Qu River, The Huangshui River - a tributary of the Yellow River - and finally the Qu River itself. Xining (西宁市), Golmud -Ge'ermu or Geermu (格尔木), Haiyan in Haibei Tibetan Autonomous Prefecture (海北藏族自治州), Ping'An in Haidong Tibetan Autonomous Prefecture (海东地区), Gonghe in Hainan Tibetan Autonomous Prefecture (海南藏族自治州), Tongren in Huangnan Tibetan Autonomous Prefecture (黄南藏族自治州), Delingha in Haixi Mongol & Tibetan Autonomous Prefecture (海西蒙古族藏族自治州), Yushu (Gyêgu) in Yushu Tibetan Autonomous Prefecture (玉树藏族自治州) , Maqen in Golog Tibetan Autonomous Prefecture (果洛藏族自治州). Qinghai Province is divided into 1 City Prefecture - Xining, 1 Prefecture - Haidong and 6 Ethnic States (Autonomous Prefectures). Such Prefectures are further subdivided into Counties. Currently the most important railroad in Qinghai Province is the now internationally famous Tibet Express, in China known as the Xizang or Qinzang Railway. This railway connects the Capital of China, Beijing, with Lhasa, Capital of Tibet (AR). In total the entire railroad measures 1956 kilometers (1215 miles), a large and rather wild section of which lies within Qinghai Province. As noted historically the first and foremost Route into Qinghai Province is through the City of Lanzhou in Gansu Province which has both a strategic and historical connection with the Capital of Qinghai, Xining. Read More about the Tibet Express and other railway journeys in Qinghai in: ' Transportation in Qinghai Province'. Until some twenty years ago road connections in Qinghai were nothing like they are today. Roads were sparse, narrow and often cut or threatened by rockfalls, flash floodings and winter snows. Today roads in Qinghai are still sparse. Officially the total length of operational roads and highways in the Province total 17,200 kilometers and rising. Read More in: ' Transportation in Qinghai Province'. 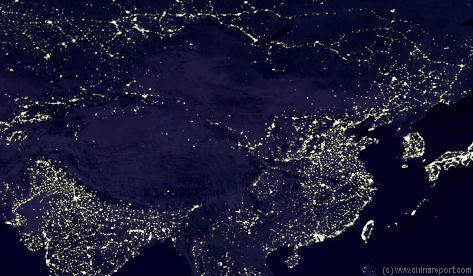 Satellite Image of China and other parts of Asia at night, clearly showing the Tibetan Plateux as a black gap. Since population has grown, population centers grown and connected to electric power-grids. Regarless many parts of Qinghai Province are virtually uninhabitable. Schematic overview of the Administrative Divisions within Qinghai Province. There are but 16 museums in Qinghai Province. The Top Tourist attractions of Qinghai Province are considered to be the the Ta'Er (kumbum) Monastery, The Dongguan Great Mosque of Xining first built in 1379 AD, the Giant Qinghai Lake which lies only 100 kilometers west of Xining, and the the natural sceneries of the Province among which first and foremost the Mengda Nature Reserve. Next in popularity are the various minority communities near Xining and in South Qinghai Province. There are however many more smaller worthwhile things to see and places to visit. Read more in: 'Landmarks, Monuments and Hotspots of Qinghai Province'. Read the Full Story in: 'Landmarks, Monuments & scenic sights of North-West Qinghai'. Welcome to the ChinaReport.com source page on Qinghai Province. This Page is intended as short cut to all chapters relating to Qinghai Province. For the full introduction and access to all chapters and related pages on Qinghai, refer to 'Qinghai Province Introduction (Index)'.